Whereas Roy Lichtenstein enlarged synthetic comic strip images and reproduced them manually to explore the complex connections between art and popular culture, James Rosenquist combined the iconography of advertising and mass media in his painting in order to express his view of modern life, plagued as it was with new products and new offers. Rosenquist arrived in New York in 1955 and became known as a result of his exhibition at the Green Gallery in 1962 showing works that belonged to what was then called the New Realism movement, which later gave rise to Pop Art. His chief source of inspiration would be magazine advertisements, which he modified using his original language, transforming them into criticisms of American society. His method of working, which involved creating images from other images, is fully in keeping with Pop Art, but for him the essential content stemmed from the confrontation of the different fragments within his painting, as occurred, for example, with Surrealist collage. 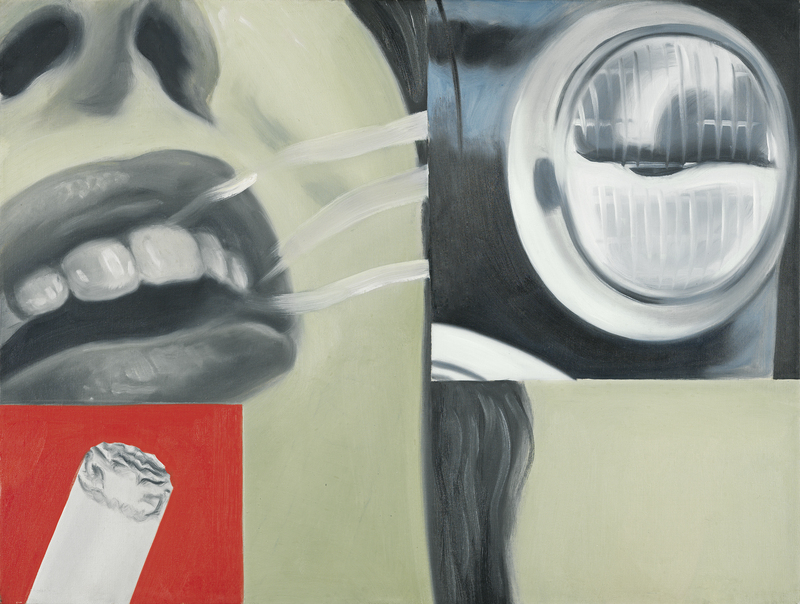 In Rosenquist’s painting that which is visible is not always easily identifiable. Although his paintings incorporate real objects and people, rendered with an almost photographic realism, they lose their literal quality on account of the manner in which they are framed or the zoom effect of his angle of vision. His stint as a painter of billboards in Times Square was influential in shaping his preference for extremely enlarged images. Smoked Glass, dated 1962, shows a foreground fragment in grisaille of the face of a woman smoking and the headlamp from a Ford car, the same model that features in a painting executed the previous year, I Love You with My Ford. The prominence of the woman’s parted lips exhaling cigarette smoke is an explicit reference to the use of sexual images in cigarette advertisements as means of encouraging consumption.